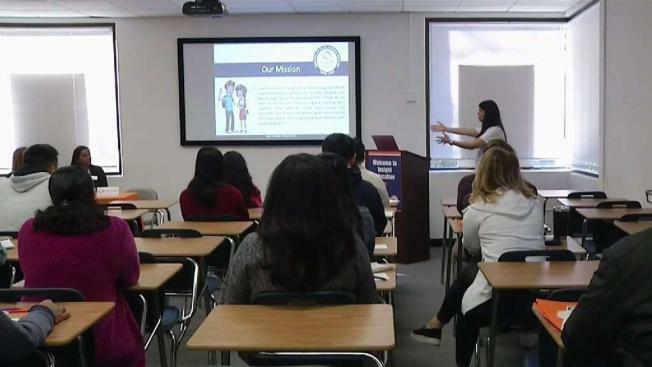 South Bay guidance counselors say getting into college will be under close scrutiny this year thanks to the cheating scandal that exposed wealthy families and their alleged bribes to get their kids into the top schools. Laura Sambol reports. South Bay guidance counselors say getting into college will be under close scrutiny this year thanks to the cheating scandal that exposed wealthy families and their alleged paid bribes to get their kids into top schools. A college seminar was held in Cupertino, California, Saturday where guidance counselors began changing the way they advise college hopefuls. "I think colleges are almost perhaps over-compensating now this year and probably next year too to make sure they appear fair and balanced in their admissions," said Amy Brennen from Insight Education, a college admissions agency. Counselors at the seminar advised students to apply to several colleges, take entrance exams early, pick extracurricular activities wisely and to be authentic on their personal statement essays. "Every year we have families asking if we'll write their student's essays for them," Brennen said. "We have parents trying to inflate student's activities and we're seeing the hammer coming down." Parents and counselors are not the only ones worried about preparing for college. Students are also concerned about whether their fellow classmates will be accepted because of merit or wealth. "There will be a lot more questions about whether kids are getting in for the right reasons and if it’s mostly just privilege at play or if they deserve the spot that they're getting," student Aashrita Natesan said.